Part of Thames Water’s ongoing programme to replace ageing assets before the end of their forecast life, a 1.2m by 1.2m penstock was required at Wandle Pumping Station but with this size too large for the 9m deep shaft and pipe, installation of a standard penstock would have caused significant delays and costly disruption. Based on a highly detailed concept from bespoke engineering specialists Unitspark, Ham Baker (who have been making penstocks since 1886), set about designing what became known as the ‘jigsaw’ penstock, crafted in segments. “We have penstocks installed all over the world, but this one required a very different way of thinking”, said Paul Higginson, Director at Ham Baker Group. “Designing a two-leaf segmented penstock (to extremely fine tolerances) that would have to be lowered down and traverse up a pipe for a very precise installation certainly called upon all our experience. 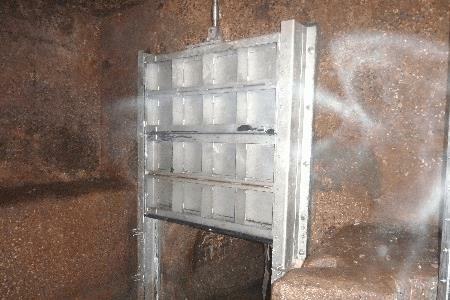 Together with Unitspark, we very much wanted to provide a long term solution for Thames Water, producing a high quality penstock made from stainless steel, including every single component part, with exacting attention to detail”. Following manufacture by Ham Baker, Unitspark set about planning the quickest and most effective way to carry out the installation of the ‘jigsaw’ penstock with only minimum disruption. The discovery of live assets and a 3m thick block of concrete (that hadn’t shown in the former sewage treatment works’ plans) made the task even more challenging. Rob Horne, Director at Unitspark, commented: “Working closely with Thames Water and Ham Baker, our highly skilled team went to great lengths to overcome the access issues. We are used to wet and difficult environments and this was no exception – also having to deal with high levels of hydrogen sulphide. Lifting, rotating and positioning the jigsaw penstock down the 9m shaft required the utmost skill and precision, before which, our engineers had to first build a fabrication bench to later assemble the penstock and its 30 component parts”. Brett Willis, Project Engineer from Thames Water added: “Ham Baker and Unitspark successfully made this a specialist mechanical job, rather than a very costly and disruptive civil engineering project. The installation has been completed in just one week, with no need for major civils, new shafts or cofferdams. The benefits in savings are substantial. Working close to a river and major strategic discharge mains drastically reduced the risk to the environment and the catchment. It is a credit to all concerned that this exercise in serious asset management was completed in such a professional manner”. For more information, visit www.hambakergroup.com and www.unitspark.com.